Sixt (and last?) week of search and travel. Canoa is a nice place. It is – of course- very warm and humid here, although less so then further North. And mosquito wise; there were hardly any. Looking at how badly we handle warmth and humidity; maybe the coast IS simply not doable for us? Even if we want it to be? This is a question that arises now and again. We did some swimming in the sea and arranged some necessary administration. Remember the small piece of land we bought, months ago? And afterwards we found out the electricity companies had changed certain rules, which meant it had no electricity anymore. Also; the water canals were dry, because a neighbour decided to change their course. We spent some time breaking off the shed that stood there and made a nice bonfire, but that was as far as the fun part went. In the meantime, we never finalized the deal and we never paid the second half of the land. The deal kept ‘hanging in the air’, until JF managed to cut a new deal, which would give us the money back(largely) and give the land back to its original owners. Because we had gone on our travels, this new deal required some notary and lawyer work, to make it valid over distance. Another administrative thing to do, was write a ‘Defense’ against the ‘Complaint’ from the Dutch Inspection (see blog https://www.vertreknaarecuador.com/2018/01/28/to-be-or-not-to-be-sequel/). To me it seems like an ‘effort in vain’, because the Inspection and the Court are like emotionless robots. And how could they ever ‘get’ it? However, if there is the slightest chance they will not start a court-case after reading, I should give it a shot. Even only if there is a miniscule chance that the people who read it, change a bit. So that a next colleague will not have to go through so much misery. Maybe. It took me 3 days to write it. And it did not contribute to any happiness, I can tell you that. Another thing we did, was drive around to see the area. We had our minds set on seeing a bit of coast nearby, which you could see from google maps satellite-view as being beautiful. It was supposedly a small road, off the state Highway, that should lead us there. Our navigation said we should take a left turn at some point. Which was exactly the point where a police car was stationed, blocking the road. A big police checkpoint was made. After driving past them 3 times (is this really the turn-off? Yes? No? Oh: it is!) and asking if the road led to a beach, the police got a bit annoyed by us blocking their checks all the time. Anyway; we did not get to take this road. And after trying several other possible options (which would also lead to that beach according to the nav, but only led it into cornfields) we gave up. After this, we tried to have lunch at a Spanish restaurant, which was supposed to be good. But it was closed. Across the street we caught the name ‘shawarma’ (which is how they spell shoarma here) and Eric and Beer thought; ‘yummie’, but that place was also closed. It was clearly not a day that would lead anywhere, so we went back to the Airbnb and made some lunch there. This is how the time in Canoa passed by. On Thursday we drove to the next Airbnb in Ayampe. 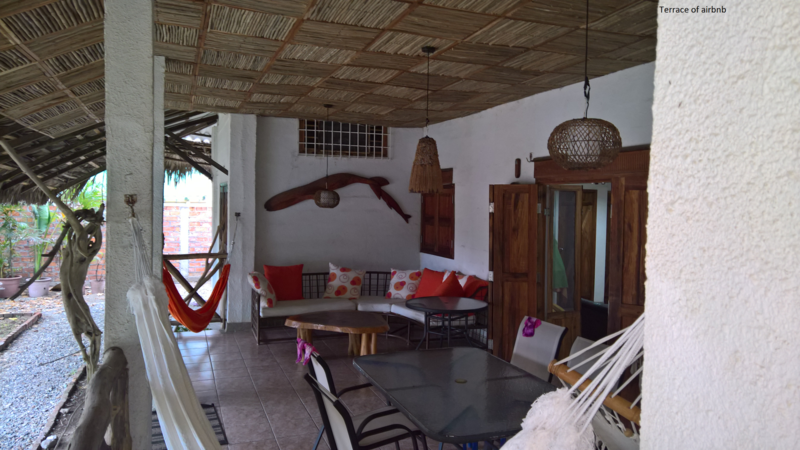 When we were suffering so much from the heat in Las Penas and Atacames, we had booked a somewhat priced Airbnb, (which had great reviews, enough space for the kids to have separate beds and airco everywhere) in Ayampe. A bit like doing shopping for groceries when you are very hungry. Not so handy, maybe. On the way to Ayampe, we passed Manta (where we actually did do shopping for groceries). 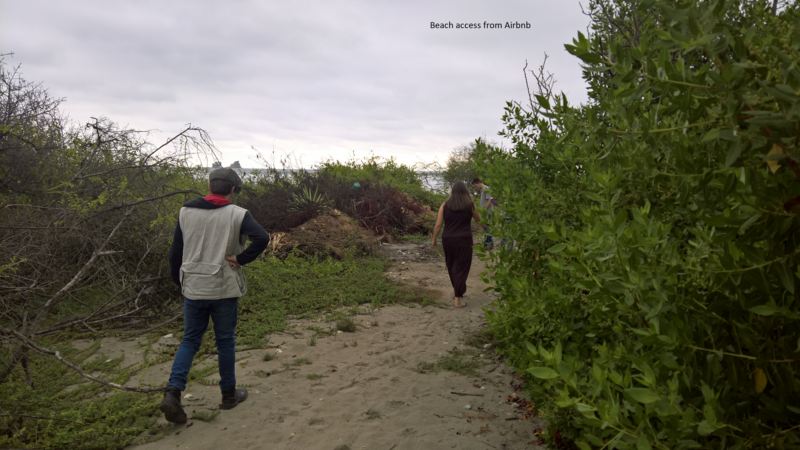 (following story, which I posted on Facebook: Interesting encounters with the police on our drive from Canoa to Ayampe. 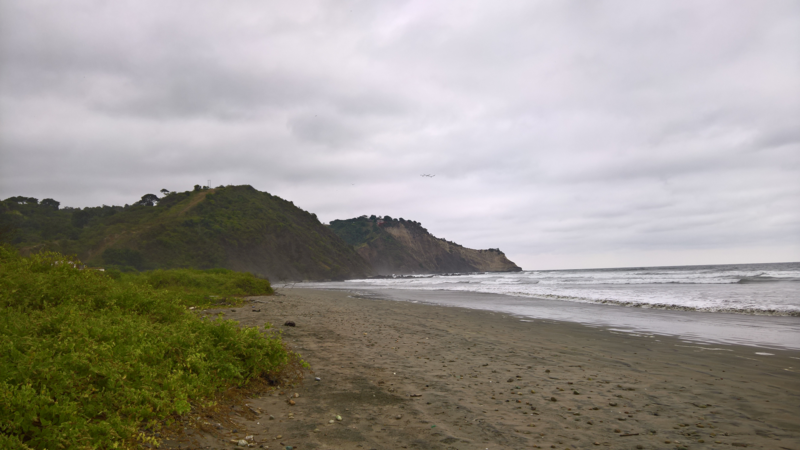 It started off with the fact that there were more checkpoints on this track, then we've ever had during the WHOLE travelling we've done so far, through Ecuador. It probably had to do with the fact that the coast attracts tourists, the holiday weekend was almost starting and tourists (usually) have money. Somewhere after Manta, we were stopped (again) to show the cedula and matricula. Friendly police officer, looked at it and sent us on our way. Driving away, very soon, we ran into a truck. He was driving very slow and there was a clear view to safely pass, so my husband passed him. Problem was; it was a double yellow line. There was another officer arranging traffic not a 100 mtrs from the checkpoint and he pulled us over. He tried to tell us how serious this event was (crossing a double yellow line). It was going to cost us 350 dollars and some points on the licence. My husband said in Spanish; is there any way to avoid this? And eventually got away with paying 50 dollars (the bribing that happens in Ecuador apparently works 2 ways?) instead of 350. The bill had to be folded up very small and given under cover of the matricula, so no one could see the officer let himself be bribed. No ticket was written. Not even 30 min later, just in front of a huge gated community; another checkpoint. I could understand that the people who live in gated communities have money, so obviously the checkpoint being in that exact position, in front of the community gate, had this reason for being there. The officer looked at the licence, at the car and was very clearly trying to figure out what he could charge us with. Eventually he got an idea and asked my husband to roll up his window a little bit. He started talking about the tinting of our car windows (they have a light brown tint). As it happens, when we were learning for the theory exam, to get our Ecuadorian licences, we had read about this. But they couldn't charge you, if the factory had done the tinting, when producing the car (instead of you doing this on your own accord). So Eric, prepared for battle, started to explain in Spanish, that it was done by the factory. The officer wanted to know in what year we bought it and tried to make us believe that in this year (last year) this rule had changed. But we were not having it. He could have made it really hard for us, by having us unload the car, so he could check for 'drugs' or whatever. Or the fact that seatbelts in the back are compulsory and the kids weren't wearing them. But he felt a bit insecure after he lost the tinted window thing and let us go. The surroundings became clearly ‘dryer’. There was even cactus growth here and there. We saw Jippijappa from a distance in the mountains. Jippijappa was mentioned to us by JF as a possible location to settle down. This, because it was somewhat higher in the mountains and therefore possibly less hot, while it would still have sea views. When we, later on, looked on google satellite maps, it became clear that there were no roads there, so it would be hard to go and have a look. But we will give it a shot. Ayampe was a very nice surprise; a small and cozy town with a nice feel. We saw people of all nationalities walking around. 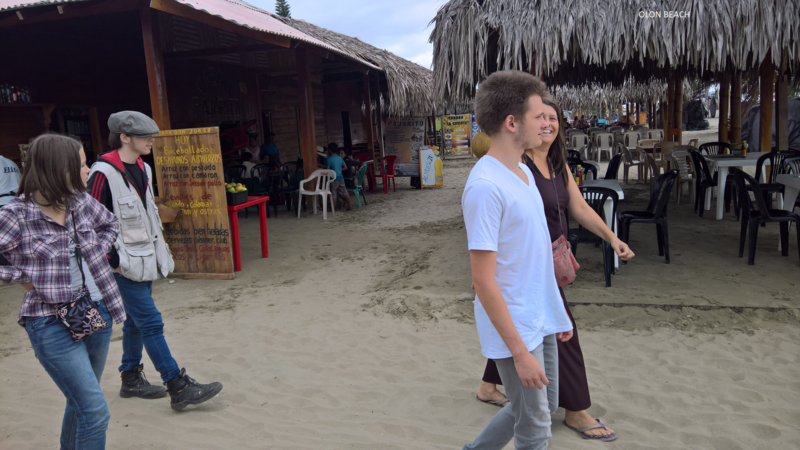 And it was less warm and humid then Canoa (would this trend continue on, when travelling further South?). Mosquito's were few. The area was surprisingly green and mountainous, after the dry-ness of the areas we saw on the trip there. 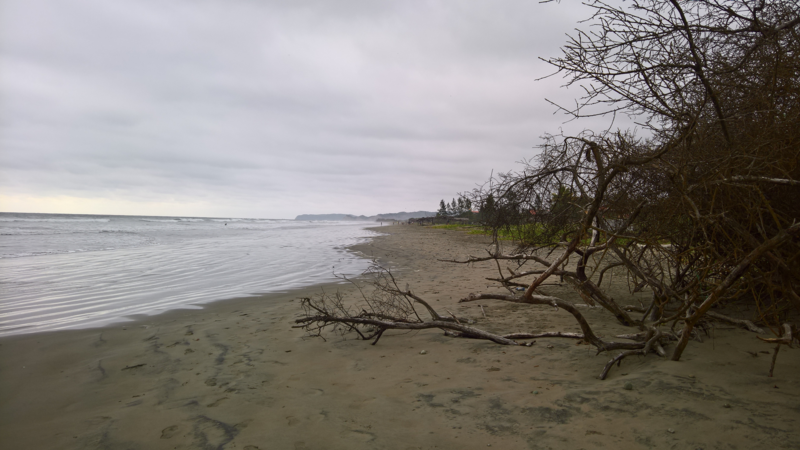 A nice, quiet beach (pictures). The Airbnb was also fantastic. Spacious, big kitchen, big terrace to sit outside, large bedrooms, everyone their own bed. Also; Lem is very happy here. And let’s not forget; a king-sized bed in the master bedroom. Then we arrived in Ecuador and at some point bought a bed, the biggest and softest we could find, 1.60 by 2.00. Normal size is 1.40 by 1.90 here. Which is what we find in almost every Airbnb or rental we’ve been in so far. We have to turn as the other one turns, because there is no space for 2 people of our length (and yes, ok, weight,…), lying facing each other, without knees bumping. And the beds are usually very hard. Even our so called ‘soft’ 1.60 bed, was still causing us to groan every time we turned. So we bought a top-layer here as well. Not the fantastic one we used to have, but doable. And it goes with us, everywhere we go. So the luxury!!!! Of sleeping in a large bed, with a good mattress AND our top-layer on it! I can spread out, lie however I want, use a blanket or not, etc. Space! Funny, the things that make you happy. How to go back to 1.40 sized beds, now??? However nice Ayampe is, the coast in total doesn’t feel right. The people are less friendly at the coast, everyone just wants to get money out of you. Everything is 3 x as expensive here, as it would be anywhere else. This is, off course, a worldwide phenomenon. In Australia we had a similar experience when we travelled. Eventually we loved the desert most, there. ‘Realness’, instead of focus on survival under a thin layer of civilization. When driving here, we passed gated community after gated community. Some even with armed guards on watchtowers. It feels so ‘not alive’, so locked up, suffocating and fearful. Some of the gated areas have their own café’s, shops, restaurants. Like little prisons, to occupy the inhabitants. I so understand that this would attract burglary, actually. Buying land here is ridiculously expensive for a country like Ecuador, where you can still buy beautiful pieces, let’s say 20 ha, with clear water rivers, flat meadows and hilly forests, for 70.000 dollars total. There might, for that price, even be a dwelling on it. On the coast it would be more like 70.000 dollars for a 1000 m2 piece of bare land. Maybe we need to steer away from the idyllic idea of living on the coast, because it doesn’t actually ‘feel’ idyllic, all in all. Also; the weather invites to rest, not to be active (unless the activity involves water). We are here in the ‘cloudy’ season. Not much rain, but constant low clouds. This weather usually persists for half a year. Then it becomes sunny and instantly too hot to be comfortable. So actually, temperature wise we came at the right time (always between 24 and 27 degrees). But sometimes I just long to see the sun. What strikes me as well, about being on the coast, is the constant roar of the sea. It is like a background noise, that fills my head and makes it hard to focus on anything. Sometimes I 'wake up' from the constantness of the roar because it becomes suddenly louder. Every time that happens I look around, expecting a tsunami. But no tsunami yet. For Eric it was very important to really experience the coast; he always felt attracted to living near the sea. He can honestly say now that he does not want to live here. The areas we liked most in Ecuador, up until now, were the transition areas between the Andes and either the coast or the Amazone. Our ‘travel and search’ is almost coming to an end. Coming Thursday we travel to Quito to talk business. We planned 12 days in Quito for this. After this we will meet our beloved friends (Nikki and JF) in Olon, which means travelling back to the coast, just South of Ayampe. 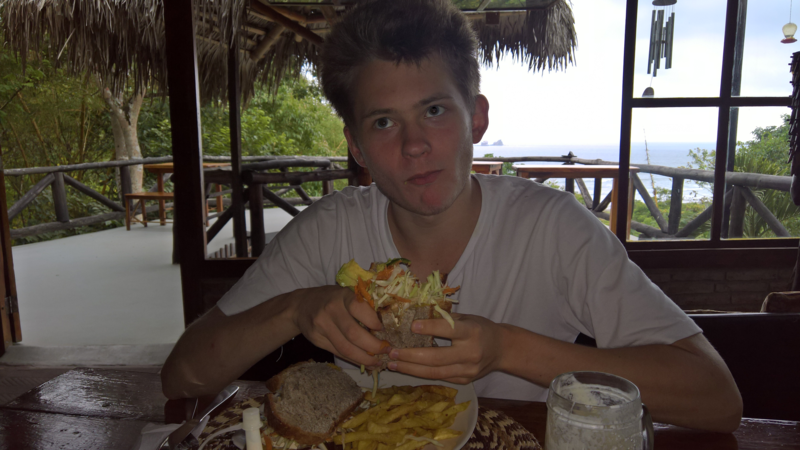 They will be there for a month, but for us money is running out and we need to find another place and plan after one week in Olon. We have some options in mind, but nothing is set yet.